Set your voice message, countries and caller ID here. In the Phone Settings tab, you'll be able to select your permitted countries, configure your voice message and enable caller ID masking. 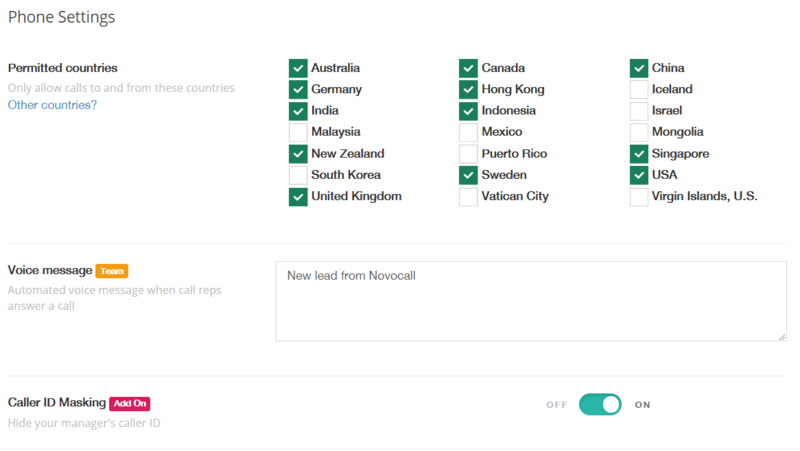 We currently enable calls from these countries. Is there some countries that you want permitted? Send a country request to us! To show certain countries on your drop down country selector, enable this and choose the countries. This is used by companies that wish to only display countries they prefer. Configure the automated voice message your call representatives will hear when they answer a call. You can make multiple widget with different voice messages for different identifier. With this feature you'll be able to show or hide your call rep's caller ID. By default, your caller ID will be hidden.